Starting early in the morning until about 2pm, the open market of Pateles is a sight on its own. This is because here you will not only find great stuff to shop, but you will also experience the melting pot of Heraklion society: Gypsies selling clothes and villagers selling their products, classy ladies checking out imitations of expensive brands, and family guys doing their weekly shopping. The fame of Pateles market has reached the tourist industry and it has become common to see passengers of cruise ferries wandering around with maps in their hands. But what can you find in this market? Well, apart from the typical fruit and vegetables (most of which are produced in Crete) you will also find spices, dairy products, olives, herbs and honey in very good prices. So far, so good…until you reach the clothing section! The first thing that will cross your mind is that everything you see is bad quality or fake (and in some cases it is true). However, most clothes you see are last season’s, sold to gypsies by the kilo and many come from popular (and expensive) stores. Of course, that doesn’t mean that you will not see imitations of popular brands, but the experienced eye of regular shoppers (and brand connoisseurs) have learned to tell the difference! If you are lucky, you will find original brands of clothes and shoes at very low prices, as well as other surprises, such as used books for 3 euros. The rule here is that there is no rule: every time you come here will be new benches with new products. If you get hungry there are several canteens selling souvlaki and sandwiches and an ice cream cart wanders around the market sections. To sum up, the open market of Pateles is a lively community that assembles once a week that has its own “cultural geography”. Loud voices and scents of grilled meat, colorful skirts of gypsy ladies, housewives dragging baby strollers through the crowd and tourists trying to capture this amusing chaos in their digital cameras. It’s worth a visit, don’t you think? As the name declares, here you will mainly find…fish! When you walk up the old market of Heraklion, just before you reach the Turkish Sebil, you will feel the intense scent of…sea! If your nose can handle it, enter the fish market lane and check out the fresh fish of the day, coming straight from the Cretan sea. Here you can discover what you can eat from the creatures you saw in Cretaquarium! Apart from the fresh fish of the day, which might not be interesting to most visitors, in the same lane you will find small fish taverns where you can actually taste what you see. 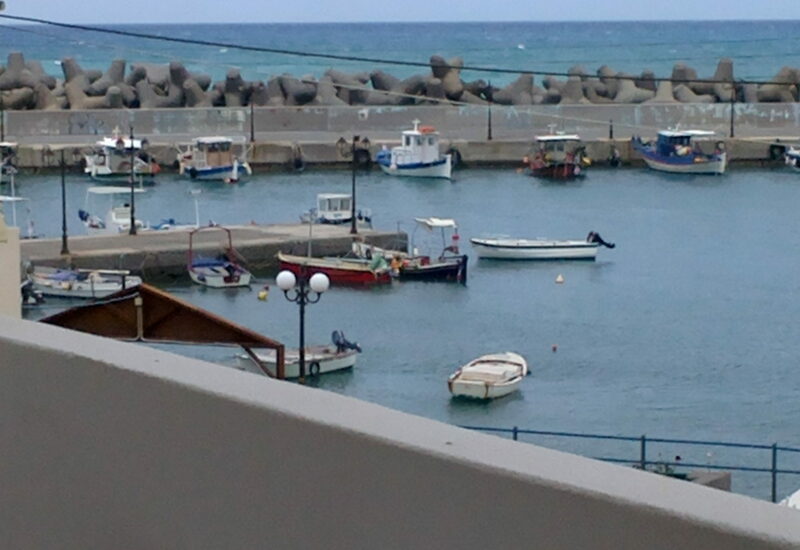 These small taverns are some of the best places in town for ouzo or wine combined with fish and sea food. Naturally, this is a favorite hang out spot for stray cats! The locals know it as “the old market” or simply “the market” (Agora). The maps list it as 1866 street (for the history, this was when one of the greatest Cretan uprisings against the Turks took place) but few know it by this name. This was the central market of the city, with small grocery stores lined up throughout the narrow street, showcasing their products on outdoor benches. Once upon a time, all households within the city walls shopped from here. In our days the old market mainly serves nearby neighborhoods with some basic products (mainly fruit and vegetables) and good quality dairy products. As the tourist industry grew now you will also find several souvenir shops, clothes and leather sandals, accessories and cheap home appliances ect. Another new trend is the opening of traditional style rakadika and taverns that transform into (VERY) loud outdoor clubs late at night. So we can say that the old market has two faces: During the day it preserves the feeling of old style Heraklion with historical scents and flavors; and during the night, it becomes an outdoor exposition of the new “modern-folk” entertainment culture of Greeks. The old market is a passage that every visitor should cross. Here you will find Cretan herbs and mountain tea, spices, fruit and vegetables, good quality cheeses, local meat, “greek style” leather sandals, various clothes and accessories and a variety of souvenirs. The scent of freshly baked loukoumades will tempt you, and the tiny cafe-rakadiko of Sarantauga (one of the oldest in town) will “invite” you for a quick raki and mezze. A bit further, in one of the intersecting lanes, you will find one of the oldest bakeries in town, the fish market and finally the lovely Turkish Sebil, where the taxi station also is. This market was the result of an initiative of local organic producers who wanted to promote their products to the city people! Today it has been embraced by many locals who support it and fits perfectly with the “alternative vibes” of Georgiadis Park. Here you can find a selection of local organic fruit and vegetables, handpicked sea salt, honey, olives, ect. It is organized every Monday, Wednesday and Friday throughout the year, from 10am to 3pm. During the summer the cafeteria of the park is also open, so you can conclude your healthy food shopping with a beer!